The Charlottesville Symphony is performing Piping the Earth on their spring concert on April 27 and 28th, the former at 8:p.m. at Old Cabell Auditorium at UVA, and the latter at 3:30 p.m. at the Martin Luther King Performing Arts Center. So happy this will be heard here, especially conducted by Ben Rous, and hope to see some of my friends! I composed Piping the Earth for the Women's Philharmonic, conducted by JoAnn Falletta. Inspired by an image from the Chuang Tzu, I composed it during a residency at Bellagio, with storms sweeping in from Lake Como. the San Francisco Examiner called it a 'musical firestorm.' Love that image, though there are also quiet moments, like a chord that 'courses up and down like a crystal fountain..." (SF Chronicle). It's also available for download as well as streaming. 2 days 2 hours ago. Excited that Zipper Music (for 2 amplified zipper players and interactive electronics, with 2 MIDI controllers) will be premiered this week by the UVA New Music Ensemble on Thursday, 4/18 at 8:00 p.m. in Old Cabell Auditorium at UVA. With thanks to Max Tfirn for developing the Max patch as I developed the wild ideas for the piece, and to Alex Christie for additional excellent tweaks. And, to Alex and Travis Thatcher for performing the MIDI Controller parts. This is the latest installment in my Quotidian Music series. Had to create an entire new graphic notation for both the zippers and controllers. Here's the first page for the zippers! 5 days 4 hours ago. An absolutely joyous evening (4/6) with superb performances of my music by outstanding colleagues and guest artists (more soon), and a reunion of a number of our terrific past and present grad students in Old Cabell Hall at UVA! 1 week 4 days ago. Composer Brian Simalchik is hosting A New Sound on WTJU (91.1 FM in Charlottesville) at 7:00 – 9:00 tonight. and you can stream later at https://www.wtju.net/recent-shows. Glyph, for solo viola string quartet and piano (composed for and dedicated to violist and dear friend Rosemary Glyde), will be on around 7:20 in the recording by the terrific violist James Dunham, the Cassatt Quartet and pianist Margaret Kampmeier, from my portrait CD Time to Burn. The entire show sounds enticing, with music by Meredith Monk, Du Yun, Lois Vierk, Christopher Cerrone and Anna Thorvaldsdottir. http://www.wtju.net 2 weeks 2 days ago. How fun that Steve Kemper and Juraj Kojs, two of my PhD students, both terrific composers who are now teaching at Rutgers University and the University of Miami respectively, are returning to UVA to give talks on my music as part of the Symposium this Friday! And also delighted that Denise von Glahn will be presenting - she does such fascinating work on music and nature, as well as gender issues in music. Looking forward! 2 weeks 3 days ago. 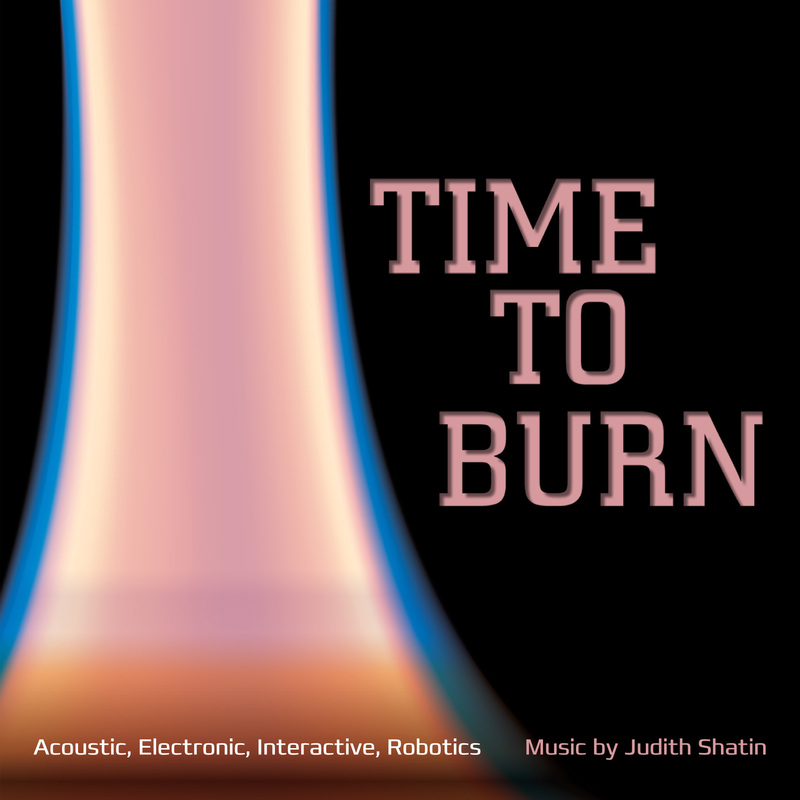 Time to Burn — Judith Shatin’s third solo CD for innova Recordings — presents a rich cross-section of her acoustic and electronic music. Called “highly inventive on every level; hugely enjoyable and deeply involving, with a constant sense of surprise” by The Washington Post, Shatin’s music combines vivid timbral hues with perceptually clear forms. “Glyph” (solo viola, string quartet and piano) opens the CD with a soaring performance by violist James Dunham, the Cassatt String Quartet and pianist Margaret Kampmeier. On the title track, masterful oboist Aaron Hill and percussionists I-Jen Fang and Mike Schutz capture the explosive world Shatin created in response to the turmoil around us. The remaining four pieces show her inventive exploration of electronics and her mastery of their combination with acoustic instruments. “Hosech Al P’ney HaTehom (Darkness Upon the Face of the Earth)” is about a world being born — out of the subterranean darkness, lightning; out of chaos, life. It is also about a new world of sound, a music constructed from the basic DNA of sound, modulated sine waves. Next is “Grito del Corazón (Cry of the Heart),” inspired by Goya’s powerful Black Paintings and commissioned by Ensemble Barcelona Nova Música. This version, for two clarinets and electronics, is performed with electrifying clarity by F. Gerard Errante and D. Gause. “Sic Transit” extends the electronic realm in a new direction, pairing I-Jen Fang with computer-controlled acoustic instruments. Scored for percussionist and CADI (Computer Assisted Drumming Instrument) — with six computer-controlled robotic arms — the piece finds Shatin playing with different levels of control, just as the events of our lives sometimes seem within our own control and sometimes beyond our control. The CD closes with the Cassatt String Quartet’s affecting performance of “Elijah’s Chariot,” scored for amplified quartet and electronics made from processed shofar calls. Again, the music is suggestive of fire, this time the fiery chariot of Elijah rising up to Heaven. "….the wonderful music on this CD, and above all the opening work, Glyph (from 1984), which means a kind of carving.This work consists of beautiful, sweeping, imaginative music in four movements titled Luminous, Flickering, Ecstatic and Incandescent….This tonal, romantic music shows how little style is the measure of good music, and how one can write romantic music and be at the same time contemporary. True, this is not likely, but it is nevertheless possible – and rare as it may be, here the possible comes into being. "Grito del Corazón (The Cry of the Heart) from 2001, for 2 clarinets and electronics, inspired by the Black Paintings of Francisco de Goya; Sic Transit, premiered in 2011, for percussionist and six robotic arms – whose repetitive rhythm moves from fulfillment of expectation to surprises, and explores our relation to time; and Hosech Al P’ney HaTehom for electronics, from 1990 – they too are beautiful works that reveal Shatin’s originality and her ability to say in sound something uniquely personal. Hosech Al P’ney HaTehom shows this: electronic music in which the noise of chaos moves and breaks as its sounds collide; and then a lightening flash triggers a wild storm, eruptions of lava, from which emerges a sound of definite pitch – and then stability…." “Over the course of a mere 75 minutes, this disc introduces the listener to the sheer depth and variety of Judith Shatin’s music…..the first piece, Glyph (1984, for solo viola, string quartet, and piano), begins in rather welcoming fashion. This movement is marked 'Luminous' (the others are 'Flickering,' 'Ecstatic' and 'Incandescent'). The playing here by soloist James Dunham is stunning: resonant and vital. The first movement invokes large open spaces (of time, possibly, as well as space); the more spiky 'Flickering' offers excellent contrast and is superbly performed, especially in the virtuosity of the speedy pizzicatos. The ecstasy of the third movement is quite reverent in nature; the virtuosity of the beautifully, skillfully written finale is most satisfying." "Judith Shatin is a true sound artist. She applies sound to the airwaves in the same way a painter applies colors to canvas. She is not trying for melodies that the listener will walk away singing, but she uses melodic material for dramatic effect….When you listen to her piece ['Elijah’s Chariot'], you feel as though you too are being swept up to Heaven by strong winds. Shatin’s music is powerful and most distinctive. As performed here and recorded in Innova’s clear sound, it is also most inviting. I think anyone who is interested in the creation of new music should sample her offerings."